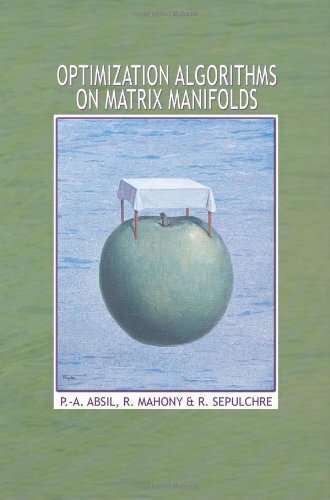 Many problems in the sciences and engineering can be rephrased as optimization problems on matrix search spaces endowed with a so-called manifold structure. This book shows how to exploit the special structure of such problems to develop efficient numerical algorithms. It places careful emphasis on both the numerical formulation of the algorithm and its differential geometric abstraction--illustrating how good algorithms draw equally from the insights of differential geometry, optimization, and numerical analysis. Contents: Introduction; Background in set theory; Topology; Connected spaces; Compact spaces; Metric spaces; Normal spaces; Algebraic topology and homotopy theory; Categories and paths; Path lifting and covering spaces; Global topology; etc. Noncommutative localization is a technique for constructing new rings by inverting elements, matrices and more generally morphisms of modules. The applications to topology are via the noncommutative localizations of the fundamental group rings. In this essay we wish to embark on the telling of a story which, almost certainly, stands only at its beginning. We shall discuss the links and the interaction between one very old subject, physics, and a much newer one, topology. A sheaf is a tool for systematically tracking locally defined data attached to the open sets of a topological space. Contents: Sheaves; Sections; Cohomology groups of a space with coefficients in a presheaf; Introduction of the family Phi; etc.